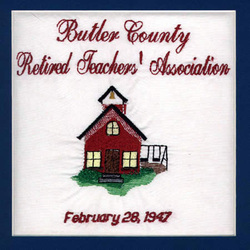 BCRTA started with twenty-six persons on February 28th, 1947 and grew to 300 members in 1976. There are now some 600 members with between 80 and 100 attending the six meetings a year. Scholarships, collecting books for Head Start and collecting pop tabs for the Ronald McDonald House are high priorities for the group. In 60 years there have been 26 presidents and hundreds even thousands of dedicated officers and members. The presidents still living are: Thelma Schraer, Harry Hann, Dale Ridenour, Robert Bogan, Al Bruno, James Barton and June E. Gilmore. Deceased presidents were: Howard O. Carter, N.B. LaMonde, Charles Finlay, Kenneth Koger, Marie Schmidt, Harold Wissman, Fred Brandel, Lester Dickey, Maurice Ittel, Marvin McCollum, George Hofstader and Robert DeMass. The next 60 years will be a challenge for the younger retiring teachers of Butler County and Ohio!